We had just about given up on sailing to Niue when a front came through to give us NNE winds. We mostly sailed the 250 NM until the wind died, motoring the last ten hours. We always troll a fishing line while offshore, and are usually lucky. The last few passages we have caught Mahi Mahi. This passage we were really lucky, or I guess unlucky. We hooked a good size marlin. He was really tough to haul in by hand and we didn’t get a good look at what we caught until we got him close to the boat. At first we thought it was a shark. We pulled him in as close to the boat as we could. He kept trying to dive under the boat. Realizing that we were not going to bring him up on the boat ( he was at least the size of Liliane), I cut the line as close as I could to the lure. Seeing that he had a sword on the end of his bill, and marlin’s can surge out of the water quite high, I was a bit nervous to get too close. A bit of excitement and lost our favourite lure. Just wish we thought about taking a picture. Oh well, we were rewarded an hour later with a good size yellow fin tuna. Feels good to be back in Niue. We were here last Oct for three days. This time we want to do some diving ( the water clarity is stunning ) and of course for the humpback whales. The whale season has started a bit later, we were told it is due to the water temperature. The day we arrived we saw no whales. Then day two, magic. One whale was laying about 150 meters from our mooring. Liliane swam to the whale while I directed her from the boat. The picture below is Liliane approaching the whale. 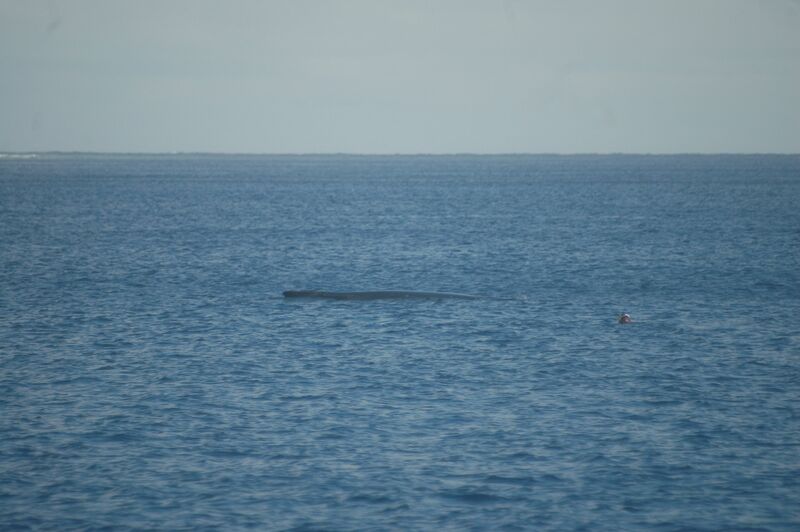 Liliane’s comments: The whale, a juvenile, was resting on the surface. I was approximately 1 meter away and she lay there looking at me for a few minutes. But the most amazing thing is that she submerged and then tuned around and peacefully came back to me. I got a little intimidated. It is not everyday a whale swims towards you. A magical experience. One that I will always remember. Here is a short version of what I recorded. Going to shore is also an adventure. Niue has a sheer coastline with no harbour. 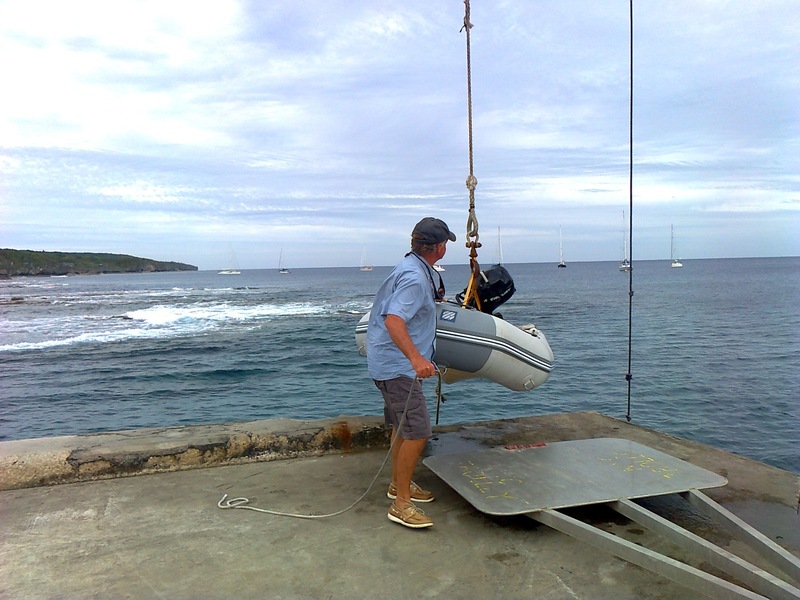 You need to raise your dinghy up with a crane onto the dock. If there is a large swell, it is impossible to go to shore. We joined the Niue Yacht Club. Funny thing is that it has a worldwide membership, but no marina or local boats. The yacht club shirt is cool though. Had to buy one. Our plan is to stay here for a couple of more weeks before heading west again for Fiji. Nice to hear from you both. The whale video was amazing. We like the new site and very glad to see you up and running again. Looking forward to reading about many more adventures.